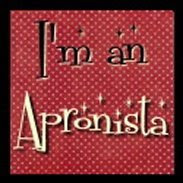 I was surfing and enjoyign the The Apronista http://apronista.ning.com/ website and came across the link.. I wanted to share it with you all . 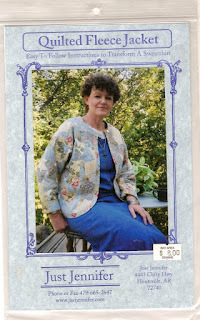 Wow 56 apron patterns in the same place for free?!?! SO close to finish!! Today is Finish it up day yippie!! giving the apron " a my way" second waist band...Adding my hand made appliqué , along with sewing the pearl beads for bubbles tada then it is finished ,I will post FINISH pictures here later today!! I keep for getting to tell you all....One of my favorite places to on line shop is " Flights of Fancy Boutique"
I have shopped with them for about 3 - 4 yrs now. They have the most AWSOME embellishments... But man even the eye candy is worth drooling at!!! Just look through some great magazines like Country Sampler magazine for instance and see how each ad is described...You will be be surprised at what is called primitive . 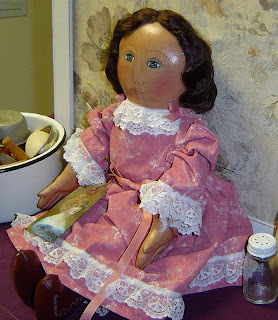 Victorian (Prim)Style Doll: =I save and cherish real vintage distressed cloth, Especially linens. 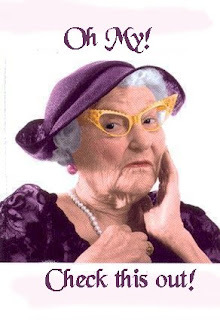 I use cotton dishcloths, towels, table cloths , handkerchiefs, From 1930's-1950's even some 1960's , Why you ask?? 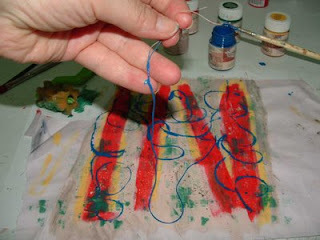 2. cut the shape you want from this, spread one side with the glue, covering entire side, hold this side into a candle flame and let it burn...it will turn black and bubbly. this part is kind of tricky and could be dangerous if you aren't careful, if it flames a little that is okay, makes more depth to shape. I usually hold this piece with needle nose pliers. Repeat for other side of shape. 3. when finished with the burning, lightly rub off the soot with paper towel. I then usually take gold paint on my finger tip and lightly dab it to achieve a burnished look. I have seen them use different colors of paint to get different looks such as a patina finish, etc. That's it !!! It really is foolproof - if you miss a spot in burning, you can go over it with more glue and re-burn. It might take some practice getting used to the burning of the glue but so far I haven't had any disasters. I like the look for stars or small wings, looks like tarnished gold or brass. Can look like rusted metal depending on the colors of paint you use. Acrylic paints are used, by the way. These will make beautiful leaves, butterflies, suns, moons, flowers too, because it can be gently shaped to give it dimension. All you need is a grocery bag! Time for Friday Flea Market!! Every participating blogger has a link back to this list so you can shop more easily. Just look for the polkadot box! Woodcut of the first patented lockstitch sewing machine, invented by Elias Howe in 1845 and patented in 1846. The machine was not successful commercially. Isaac Singer improved it and manufactured the first commercially successful machine in 1850. Howe sued Singer for patent infringement and won in 1854, and subsequently earned about 2 million dollars in royalties for his invention. Alterations: removed the caption, which read: "The first Howe sewing machine"
A sewing machine is a textile machine used to stitch fabric or other material together with thread. Sewing machines were invented during the first Industrial Revolution with the intention of decreasing the amount of manual sewing work performed in cloth companies. Since the invention of the first working sewing machine, generally considered to have been the work of Englishman Thomas Saint in 1790, the sewing machine has vastly improved the efficiency and productivity of fabric and clothing industries. While your visiting Heather be sure to see her wonderful tutorials . 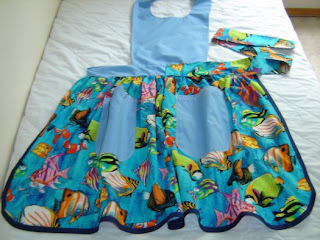 here is the aprons that Im working on. 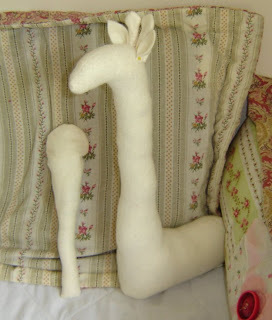 I am makin two,of the same pattern but each is being embellished in diffrent ways,One is a gift for a friend of mine who just had a knee replacement, The second will be for a swap I'm doing ..It is such fun!! I felt totally lost, I gessoed and flesh painted and sanded and buffed 3 seperate times. 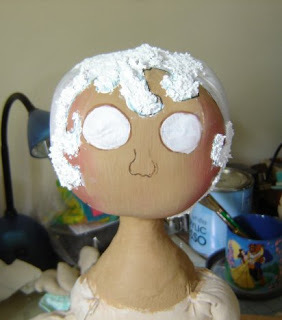 Now am applying snow texture which will become her hair, Her eyes I can't wait to start!! 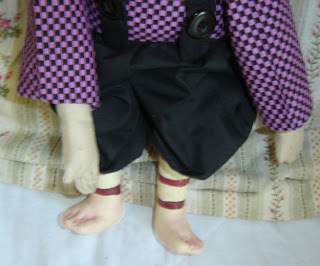 I am really stepping out on this doll,wait till you see the colors I have chosen to dress her in.IF SHE doesn't change her mind,Ya know these gal's have a way of doing that! Working away I'm on these projects!! Loving every minute of it! Arte Y Pico Award ! I am so honored to have received this wonderful award! The "Arte y Pico" award was created and to be given to bloggers who inspire others with their creative energy and their talents, whether it be writing, artwork in all media's. When you receive this award it is considered a "special honor". Once you have received this award, you are to pass it on to at least 5 others. 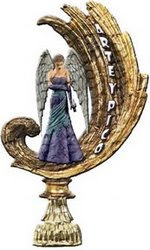 Please read more info on this wonderful award , visit: http://www.arteypico.blogspot.com/. 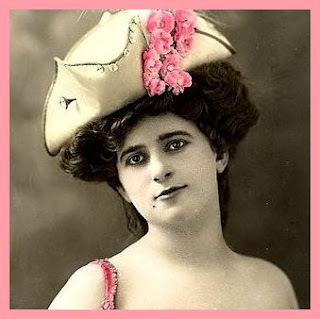 There are so many talented loving,caring,sharing women I just adore , Women whose blogs inspire me, Make me smile, Up lift me in a way that's beyond expalinging ,But always walk away feeling better than before my visit, Where would we all be with out these women in our lives whether they know it or not!! 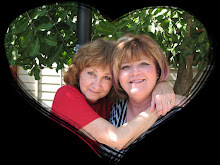 I have awarded some of these wonderful woman before, As I sat down to blog my thouhts, I really searched my heart... I tried to pick five other bloggers that change me in such wonderful creative ways, Wherther it's their creation or their written words. 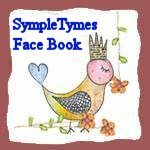 I hope you will visit each of them- they bring so much their heart and love into the blogging world!Some I have know a long time, Some are new friends but yet sure have touched me.. Ask Helen a question she gives of herself 100% to help you, Helping you under stand and see the answer to your question. Helen's art is gorgeous and her love and passion shows through and touches you. 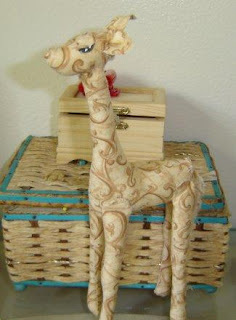 Helen is sooooo talented and her creations make you go * OHWOW* Her techniques are so inspiring ! My life has been diffently enriched by her art and by her herself ! 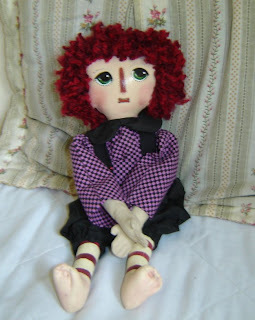 Connie is a very special friend, When I first started out in making dolls, I did not even know what they meant when people said "Template" Connie was so kind to take me under her wing and explain the lingo of doll making, She creates pin dolls like no one else,They truly are works of art.Her talent has no bounds, Wife, Mother of 3, yet she always has time to help other learn Connie is a giving and sharing doll artist , She always has praise and kind words for others. 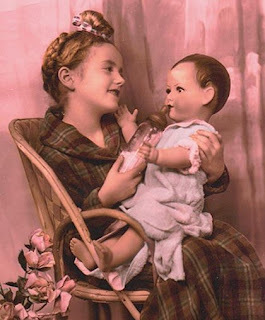 Connie is very special doll artist and a very special friend. 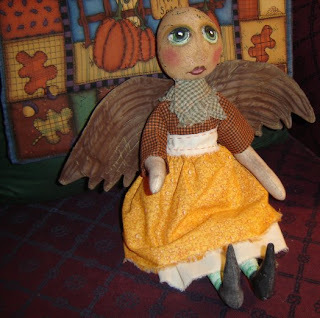 for others, Sharing and caring is her middle name, Linda alone has opened windows wide open for other giving of her self ..of her talent.. of her time .. all for the growing doll makers , and artists in any media. Talk about inspiration this artist just knocks your socks off when you visit her blo, Dawn is always there for you to answer and give any info she can to help you, Dawn is blessed with so much talent it is just mind blowing,You do leave her blog shaking your head and smiling ear to ear.Inspired beyond words. Just goes to show you what a caring person Cathy is. originally uploaded by Hillary Lang. Hillary posted these on her flickr . http://www.flickr.com/photos/hillarylang/ .. oOooh aren't these just the sweetest,, Just some thing so vintage and yesteryear about them.. Just so simple....I Love them! Happy Good Monday Morning to you all! I'm having a nice slow Monday morning, Think I ate some thing for supper last niht that just hasn't agreed with my tummy..Was up with a tummy ache most of the night and still is bothering me, Oh shucks darn guess I will have to take it a bit easy today and just be creative *BigSmile* Playing and stitching and drinking hot reen tea tada!! 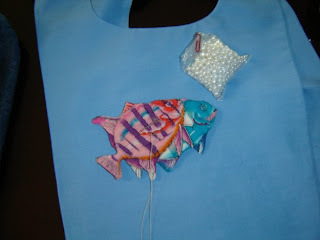 I can't wait to ive this a try,I LOVED how she did with the doll les..What fun doin this on fabric!! This is a article I'm writing "What Primitive Means"
back as I am able to continue to write. wow this question has beem around for ages, I think well I know even way back in the beginning of time. 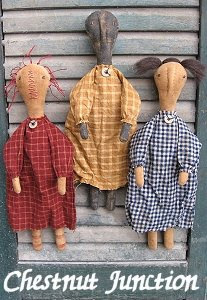 Primitive is such a cozy warm fuzzie and even comforting style of art. 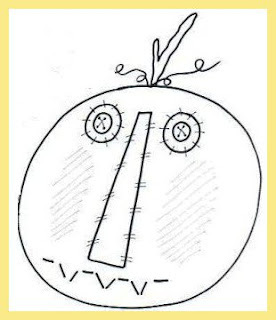 It does bring out the child- like creativity in us. Primitive has evolved in to many styles names and so on. 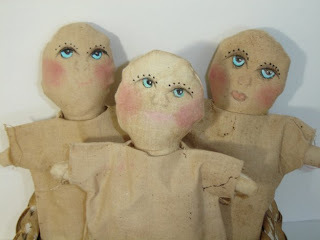 practically before they could walk and talk they were being taught the ways of stitching, Times were hard and many did not have sewing machines, every thing they did was by hand. 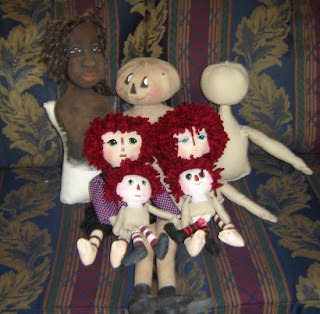 Aging our Primitives with all our own Tea's,Coffees,Vanilla's, The smells of so many wonderful memories never a problem and in the end you have created this one of a kind doll person I and many other have found it totally relaxing to the point of bein so laid back and letting the art form Primitively Artistic just do her thing! isn't this gal lucky to own a signed book by Edith her self,wow this is a rare thing! For me it's like Sprin has sprun, Why you say?Aren't these just aprons??? These are not you usual aprons! I have found my self doing the neatest things. I HURRY to get house work done, Even planning ahead supper. Even aprons from my favorite era 1800's. 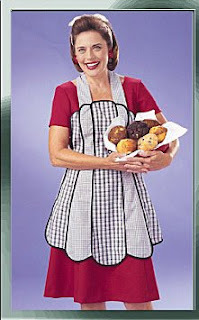 You will be suprised how cherished a Apron as a gift really is. This is my first attempt at clay ove cloth.I have no idea what I'm doing. 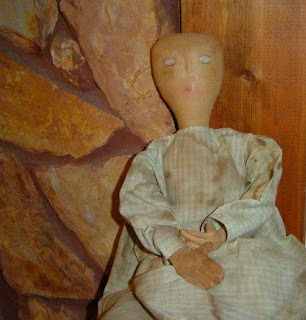 I'm wondering already if I have messes up,The dolls head is cloth,rouns,stuffed firm,I then applie on coat of eaao,sanded and buffed,I was going to paith the head and at the last minute and with a clean sewing room felt so creative,So decided to try clay over cloth,But it is not just cloth now its a gesso clothed head. 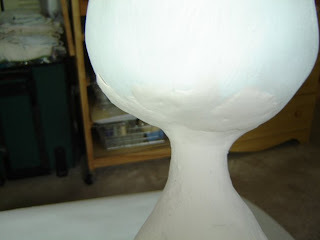 Question#6: can this be smoothed,blended and have more clay added? 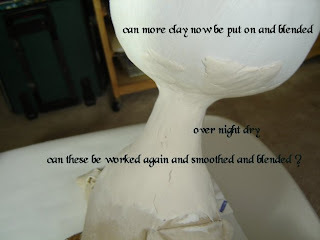 Question# 7 can this be smoothed,blended and have more clay added? 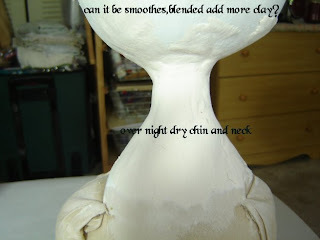 Question#8 can this be smoothed,blended and have more clay added? Thanks so much Cathy, I'm honored!!! Alrighty here comes da rules ready or not!!! The rules for the “You Make My Day” award are to present it to those whose blogs bring you happiness and inspiration and make you feel happy about blog land. Let them know through email or by posting a comment on their blog so they can pass it on. 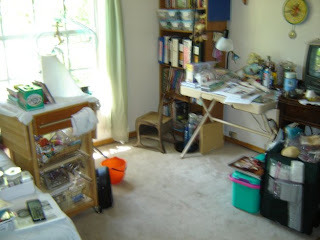 Sewing room scrubbed from ceiling fan down tada! 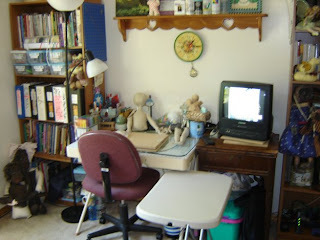 Why does a sparkling clean sewing room always makes you want to sit down and start creating? Do , Re , and Mi !! 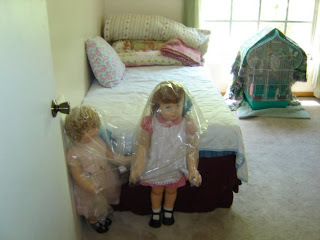 I used muslin that I aged for their bodies and dresses. I hand painted their faces. Aren't they sweet,They would be a nice touch of FolArt any where you wanted it to be, Or keep them together in your favorite bowl or basket. 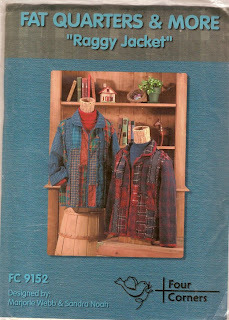 Please visit my etsy shop for these and other wonderful patterns!! 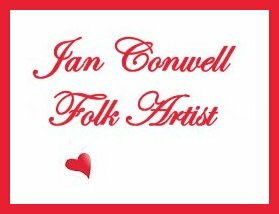 On the Humble Arts group every one has been talking and showing their wonderful creations they are working on..So thought i'd share what I have been working on too.. I don't why but for some reason I slow down when it comes to the dressing part as you can see. 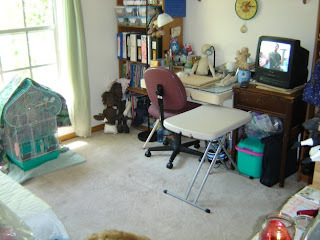 We have some one coming Saturday to look at our home so its a on going thing to try to keep every thing neat and spotless *ugh* But when we sell it will so worth it! 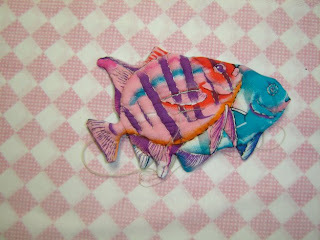 wow I just happened to come by her blog.Oh Gosh you all have got to stop by and see her art work..It is INCREDIBLE! You all probably her, I do not, But I am in love with her talent and creations! Primitive Times Magazine April Issue is out. I got my issue stop by and get yours!! Here is the list of Requirements for your apron. 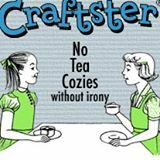 Included with your apron must be a dish or tea towel. It doesn't have to be hand-made but that would be nice. Something that goes with your apron. Also you are to include the recipe for your favorite NON-ALCOHOLIC summer beverage. When is the apron due? 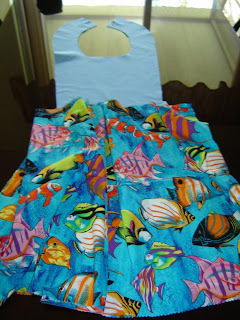 Aprons must be mailed out by June 1st at the latest.Deadline to commit to the swap - April 15th. That gives you 2 weeks to decide and we need something better to look forward to on the 15th than Taxes! I will collect all the names, swap them out, and then post you an e-mail listing your partner's information. 6) You must include your dress size. I am sorry but this is important. 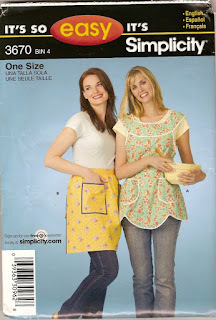 It is very hard making an apron for someone when you have no clue what size they are.You may also include some likes and dislikes to help your partner make their fabric choices. 7) This bit is new. You may list people you would rather not swap with. That sounds bad BUT many of you have now swapped with each other here and other places. There are also siblings, in-laws, parents and children in this swap and I can understand you wanting to meet new people so please fill in names here so I can more easily double check.There is no limit to how many people can enter this swap (yet). I don't like to be left out and don't want to leave others out.This swap will be run just like the last one where your partner is a surprise. 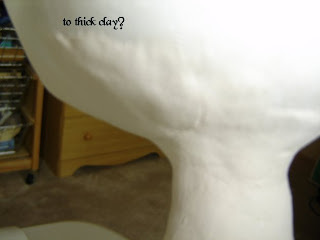 I have a sewing question,What my question is.. I want to make the above figurines into pincushions.. 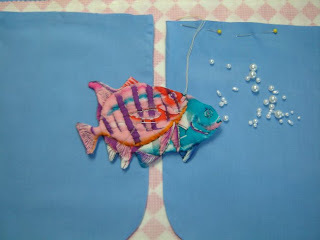 I'm a sewer wanna be , Not by any means a learned sewer(expert) (I will get there one day though stitch by stitch )...How do I make a round bottom to come up and around the base and fit snuggly ? Hope some one can help me.. Do I make a circle for the bottom and then gather fabric to attach to it?? Should I place card board at the bottom? 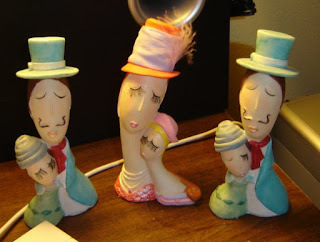 ?, Do you think these figurines are wron to use as pincushions?Meaning their shape? 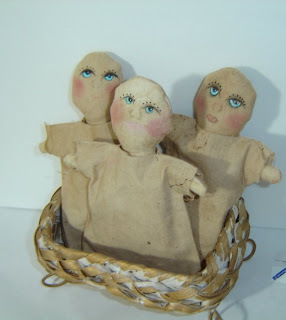 I was thinking of those antique half doll pincushions?